Best Rashomon quotes, with movie clips, ranked by fans. This list of great movie quotes from Rashomon collects all of the most famous lines from the film in one place, allowing you to pick the top quotes and move them up the list. Quotations from movies are repeated all the time in other movies, on television, in speeches and in day-to-day life, so having a good knowledge of good movie quotes (and having resources useful to search movie quotes) have become essential. Many of the most notable quotes come from sources you may not even know about, some could even be the most memorable Rashomon quotes or come from some of the other most quotable movies of all time. Consistently named one of the best movies of all time, Rashomon is considered to be the movie that introduced American audiences to Japanese cinema. Akira Kurosawa's classic follows four people who all have different versions of the same murder as they sort through the lies and try to find shreds of humanity within themselves. The film won an Oscar for Best Foreign Film in 1951 and is still a cinematic classic to this day. 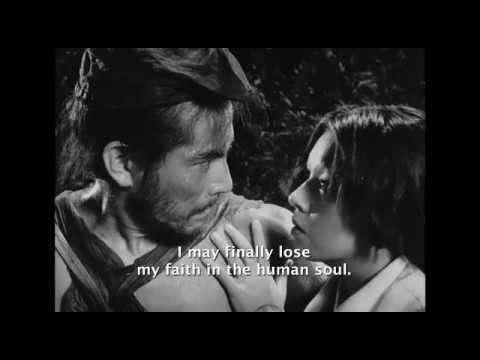 This list includes all the best Rashomon lines and moments, just as they appeared in the actual movie script. Whether they are funny quotes, sad quotes, quotes about love or death, all the most famous Rashomon quotes are here. Priest: Dead men tell no lies. Commoner: But is there anyone who's really good? Maybe goodness is just make-believe. Commoner: Man just wants to forget the bad stuff, and believe in the made-up good stuff. It's easier that way. What's Wrong With Being Selfish? Commoner: What's wrong with that? That's the way we are, the way we live. You just can't live unless you're what you call selfish. Commoner: We all want to forget something, so we tell stories. It's easier that way.